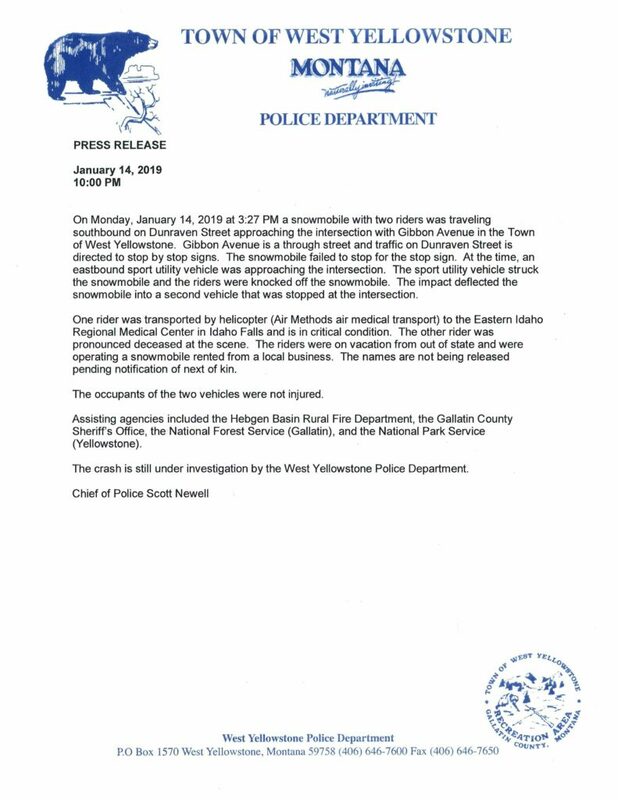 On Monday, January 14, 2019 at 3:27 PM a snowmobile with two riders was traveling southbound on Dunraven Street approaching the intersection with Gibbon Avenue in the Town of West Yellowstone. Gibbon Avenue is a through street and traffic on Dunraven Street is directed to stop by stop signs. The snowmobile failed to stop for the stop sign. At the time, an eastbound sport utility vehicle was approaching the intersection. The sport utility vehicle struck the snowmobile and the riders were knocked off the snowmobile. The impact deflected the snowmobile into a second vehicle that was stopped at the intersection. One rider was transported by helicopter (Air Methods air medical transport) to the Eastern Idaho Regional Medical Center in Idaho Falls and is in critical condition. The other rider was pronounced deceased at the scene. The riders were on vacation from out of state and were operating a snowmobile rented from a local business. The names are not being released pending notification of next of kin. The occupants of the two vehicles were not injured.